Lentil Quinoa Salad – Voila! Summer is around the corner and everyone’s always looking for a good salad to bring to their next picnic. Or this is great to make on Sunday and eat for lunch the rest of the week. It’s filling, fresh, healthy and really good. You could adapt it a but by adding sauteed eggplant, chopped tomatoes or chickpeas – if you want to add even more protein! Enjoy! 1. Cook quinoa according to packaging. 2. In a small bowl, whisk the mustard and vinegar together, and drizzle in the oil to make an emulsion. Add the garlic, lime zest, and salt, and pepper, to taste. 3. 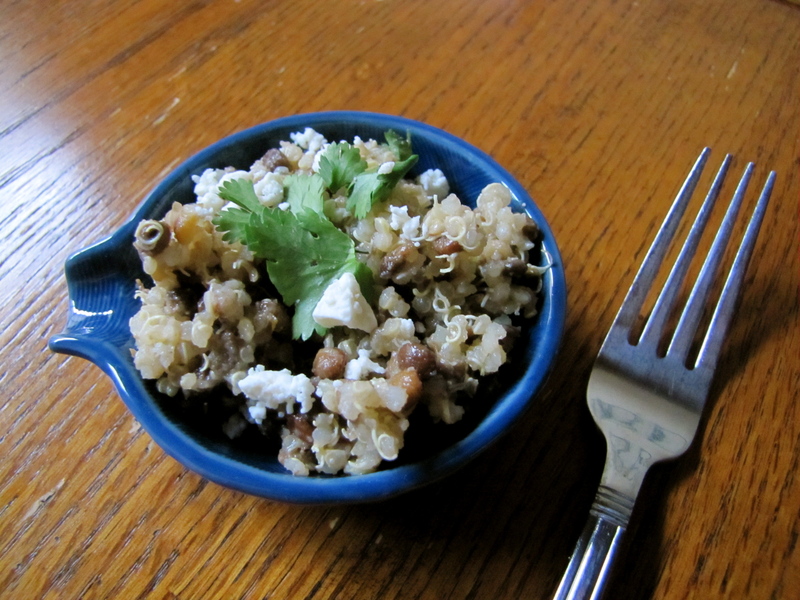 To assemble the salad: In a medium salad bowl, mix the quinoa, lentils, green onions, and chopped cilantro. Top the salad with the dressing, toss to coat and serve. Sprinkle with feta (optional). Pingback: Fig Tomato Arugula Salad | Voila!